Sven Väth mixes the universal hits and hidden gems of this year´s club music into a 160-minute trip into the ‘now’ of electronic music. The 12th volume of Väth´s ‘Sound of the Season’ series is a unique listening experience for electronic music aficionadas and innocent bystanders alike. 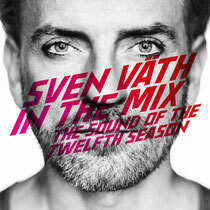 2011 has arguably been the biggest year to date for Sven Väth and his globally respected Cocoon empire. A world tour celebrating 30 years as a DJ, a massive season at Amnesia under the ‘Cocoon Heroes’ banner and a string of exceptionally good compilation albums, artist albums and singles have all led to this, the 12th edition of Väth’s ‘Sound of the Season’ compilation. Sven Väth’s importance in dance music’s history should need little explanation, from his days at the Dorian Gray club in the early eighties, through the setting up of the seminal EyeQ label and legendary DJ sets at Omen, Väth’s influence on the scene has been immense. The launching of Cocoon in the nineties saw Väth embark upon the creation of one of dance music’s most successful brands and an endlessly exciting hotbed for musical talent. The ‘Sound of the Season’ compilation series has been a high water marker for quality every year since its launch in 1999 and this year’s edition certainly lives up to every expectation. Spread across two discs representing night (disc 1) and day (disc 2), the mix draws on the best of this year’s house and techno and fuses it into a seamless journey that provides a lasting memory of the sound of 2011. It’s impossible to pick highlights from a selection that shines at every turn, from the deep atmospherics of DJ Koze remix of Efdemin, through the peak time intensity of ‘Adonis’ by Boys Noize to the closing strains of Roman Flügel’s ‘Brian le Bon’ the first disc is a delight from beginning to end. Disc 2 ups the ante once again with a sumptuous mix that includes music from the likes of Steffi, Ame, Maceo Plex and Move D to name but a few. The music flows through a soundscape of fractured vocals, rolling drums and throbbing basslines to deliver a musical concoction that leaves you craving more as it draws to a close. It’s out now on Cocoon.